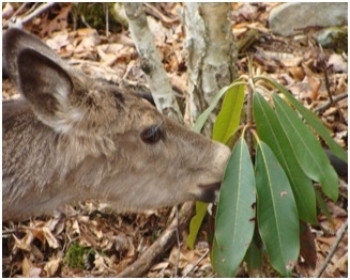 Taste-based deer repellents are applied directly to plants and will repel deer due to their undesirable taste. Taste based materials must be consumed in order to become effective. Damages sometimes can be substantial, but will occur before deer become trained to the fact that your plants have an offensive taste. Odor-based deer repellents deter deer from your plants and property by their offensive smell. When applied directly to the landscapes that surround your yard, deer are less likely to try and eat the plant or approach your yard. Odor- and Taste-based deer repellents provide the benefits of both kinds of materials. Your Wildlife Professionals. Inc. will implement a deer management/treatment strategy that deters deer from coming on your property and destroying your valuable landscape. After evaluating the deer damage on your property, one of our biologists will carefully treat your landscaping with a fine mist of weather resistant organic repellant. Most services or product directions will suggest spot treating areas that have been damaged already. Your Wildlife Professionals. Inc. will blanket your entire property, which in most cases will change a deer’s pattern and keep them away from your property. Deer are creatures of habit and once they realize an odorized threat or that your landscape is an undesirable food source, they will steer clear and look elsewhere. To ensure maximum protection, and to let the deer know that your property is off limits, we suggest spraying/treating year round. Our deer repellent service is necessary in the summer as new plant growth constantly appears and just as crucial in the winter when a deer’s natural foods are scarce. An average yard is treated 9-12 times per year and the price varies according to the size of your yard and what you have planted. - Save large amounts of money by not having to replace your trees, shrubs, and flowers on an annual basis. - Eliminate the need for unsightly and expensive fences. - Be able to enjoy your landscape instead of feeling frustrated and angry about it. - Decrease deer traffic on your property which will result in less deer droppings on your lawn and less potential for tick-borne diseases. If you need more information on how deer repellents work, our deer repellent services, how to get rid of deer, or how to deter deer in yard, Your Wildlife Professionals, Inc. in the counties, cities and towns of Alexandria, Arlington, Bedford, Blacksburg, Bristol, Charlottesville, Covington, Chesapeake, Danville, Fairfax, Fredericksburg, Hampton, Harrisonburg, Lexington, Lynchburg, Loudon, Manassas, Martinsville, Newport News, Norfolk, Richmond, Roanoke, Smith Mountain Lake, Staunton, Virginia Beach, Waynesboro, Williamsburg, Winchester, Wytheville, and Yorktown Virginia, Your Wildlife Professionals, Inc. is here to help you. Please Contact Us to help solve your deer problem. The white-tailed deer is probably one of the most well known animals in urban environments. Its moderately long and white-haired underside of its tail that waives at you as it runs away is its most obvious detail when identifying the species. The males will have antlers during part of the year and females never develop antlers. Deer Average Adult Length: 54” - 78” long. Deer Tail Length: 6” - 11 1/2” long. 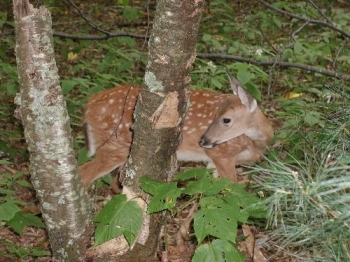 Deer Fawn Young at Birth: reddish-brown to reddish yellow with white spots. Average Deer Fawn Weight: 4 – 7 pounds at birth. Average Deer Fawn Length: 17” – 19” long at birth. 3 – 5 Months: Loose their spots. Loud, hoarse, high pitched shriek when scared or threatened. You will often hear them snort or blow when standing still. This is usually communication to other deer of a possible threat that they see or smell. It may also be used to scare a motionless object that they may perceive as a threat to make it move. Both bucks and does will stamp their feet on the ground whether threatened or not. This usually precedes the snort or the blow. Fawns will baa and does will bleat for communication when separated. The doe is always within range to hear the fawn baa if distressed. Your Wildlife Professionals, Inc. has been providing deer identification in Virginia since 1998. If you need deer description, deer body size, deer average adult length, deer tail length, deer average adult weight, deer fawn young at birth, average deer fawn weight, average deer fawn length, or deer voice & sounds in Alexandria, Arlington, Bedford, Blacksburg, Bristol, Charlottesville, Covington, Chesapeake, Danville, Fairfax, Fredericksburg, Hampton, Harrisonburg, Lexington, Lynchburg, Loudon, Manassas, Martinsville, Newport News, Norfolk, Richmond, Roanoke, Smith Mountain Lake, Staunton, Virginia Beach, Waynesboro, Williamsburg, Winchester, Wytheville, and Yorktown Virginia, Your Wildlife Professionals, Inc. is available to solve your deer problem. Your Wildlife Professionals, Inc. considers both the time of year deer breed, when deer fawns are born, deer gestation period, the number of deer fawns born, deer weaning period, and the average reproductive age of deer within their respective geographic region of Virginia prior to controlling deer on your property in Alexandria, Arlington, Bedford, Blacksburg, Bristol, Charlottesville, Covington, Chesapeake, Danville, Fairfax, Fredericksburg, Hampton, Harrisonburg, Lexington, Lynchburg, Loudon, Manassas, Martinsville, Newport News, Norfolk, Richmond, Roanoke, Smith Mountain Lake, Staunton, Virginia Beach, Waynesboro, Williamsburg, Winchester, Wytheville, or Yorktown Virginia. Time of Year Deer Breed: September – February. November is the peak month. Does will come into heat every 28 days until breeding has occurred. Deer Gestation Period: 6 ½ - 7 months. Eyes are open and they can stand freely at birth. They stay relatively close to their birth place for several weeks. Mother will leave young, but will stay within hearing distance of their calls. 3 to 4 weeks the fawn will fallow mother and start eating solid foods. Nursing can last up to 6 months. Deer Weaning Period: 1 Year. Average Reproductive Age of Deer: 1 ½ years old. 6 – 8 months old is not uncommon. Your Wildlife Professionals, Inc. provide deer removal & control on residential and commercial properties in Virginia. It is not always important to know everything about deer, but often clients need to know other information about deer in Virginia. Below is some additional information about deer, such as deer habitat, where do deer live, home range of a deer, deer food, deer habits, average life span of a deer, and deer health concerns that you may want to know. If you live in Alexandria, Arlington, Bedford, Blacksburg, Bristol, Charlottesville, Covington, Chesapeake, Danville, Fairfax, Fredericksburg, Hampton, Harrisonburg, Lexington, Lynchburg, Loudon, Manassas, Martinsville, Newport News, Norfolk, Richmond, Roanoke, Smith Mountain Lake, Staunton, Virginia Beach, Waynesboro, Williamsburg, Winchester, Wytheville, or Yorktown Virginia and would like to know more about deer, please give us a call. The white-tailed deer prefers timbered areas with borders which provides favorable browse close to cover or areas close to agriculture. The white-tailed deer does not have a permanent home and do not prepare a nest for the fawns. Their home usually changes with food abundance. 1/2 – 1 ½ square miles. Shifts with food abundance. A bucks range during the breeding season or rut may extend out to 5 miles. White-tailed deer are browsing animals. They feed primarily on leaves, twigs, fruits of trees, shrubs, and the foliage of herbaceous plants. They will eat seeds, especially out of bird feeders, grasses and agricultural plants. When acorns start falling in September, they are the preferred food source until they are gone. They are active throughout the day. Mostly from late afternoon through the night into the early morning daylight hours. 2 - 3 years in the wild. Maximum lifespan is 20 years, but few live up to 10 years. Flukes, adult and larval tapeworms, fleas, adult and larval flies, ticks, lice, and roundworms parasitize white-tailed deer. White-tailed deer serve as a feeding host and can transfer ticks that may have Lyme, Ehrlichiosis, and Babesiosis. White-tailed deer are often the blame for Lyme disease. Lyme disease is a bacterium that is manufactured from a rodent, such as a chipmunk, that is moved by a nymph stage tick from the rodent to a human. 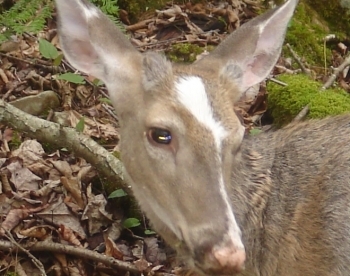 White-tailed deer cannot contract Lyme disease. White-tailed deer are a host that the adult tick feeds off of until it falls off the deer, then gets on a person. ​​​​Your Wildlife Professionals, Inc. has been providing dead deer removal services in Virginia since 1998. If you have a dead deer in your yard in Alexandria, Arlington, Bedford, Blacksburg, Bristol, Charlottesville, Covington, Chesapeake, Danville, Fairfax, Fredericksburg, Hampton, Harrisonburg, Lexington, Lynchburg, Loudon, Manassas, Martinsville, Newport News, Norfolk, Richmond, Roanoke, Smith Mountain Lake, Staunton, Virginia Beach, Waynesboro, Williamsburg, Winchester, Wytheville, and Yorktown Virginia, Your Wildlife Professionals, Inc. is available to remove a dead deer from your property. Damage to ornamental plants, trees, shrubs, and flowers by white-tailed deer has increased dramatically over recent years. Deer damage to home landscapes and gardens is the number one complaint in urban areas. An integrated approach to deer damage management can often be the most optimal way to deal with the problem. Using any one or a combination of strategies including population management, fencing, plant selection, and commercial repellants can be the best approach to minimize deer damage. Your Wildlife Professionals, Inc. offers a deer repellent treatment service which uses a combination of organic products to prevent deer from eating your valuable landscape. After years of research, experiments and field tests, Your Wildlife Professionals, Inc. wildlife biologists have designed a successful treatment program using a combination of deer repellants. Our deer repellent treatment is environmentally safe, harmless to humans and pets, and will not damage trees, shrubs, or flowers. Repellants discourage deer feeding by having an offensive taste, odor, or a combination of both. Continuous use of the same product will prove to be ineffective, and repellants that work in one location may not work in another. Our best results have been found in areas with moderate deer pressure and feeding. Areas with high deer densities, which is rare in our area, will continue to experience some damage because your area has most likely surpassed its carrying capacity and alternate food sources have been extinguished. Your Wildlife Professionals, Inc. provides deer removal, dead deer removal, deer control, can get rid of deer in yard, and deer infestations by treating your landscape with deer repellants in the counties, cities and towns of Alexandria, Arlington, Bedford, Blacksburg, Bristol, Charlottesville, Covington, Chesapeake, Danville, Fairfax, Fredericksburg, Hampton, Harrisonburg, Lexington, Lynchburg, Loudon, Manassas, Martinsville, Newport News, Norfolk, Richmond, Roanoke, Smith Mountain Lake, Staunton, Virginia Beach, Waynesboro, Williamsburg, Winchester, Wytheville, and Yorktown Virginia, Your Wildlife Professionals, Inc. is here to help you. Please Contact Us to help solve your deer problem.